A fascinating portrait of the people, places, events, conflicts, and impact of the Great War, released to coincide with the centennial of the war's end. The course of the First World War, from Sarajevo to Versailles, is revealed in striking visual detail. 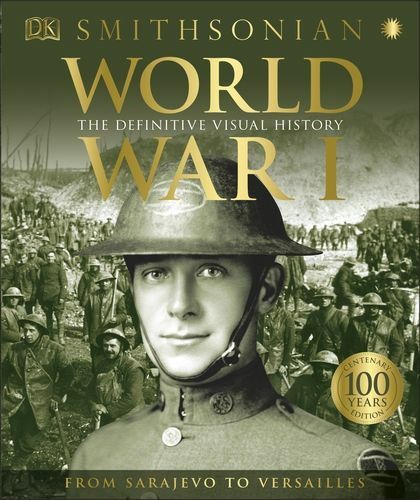 Engaging narrative, detailed maps, historic photographs, and a rich collection of arms, equipment, and artifacts re-create the experience of titanic World War I battles such as Gallipoli, the Somme, and Verdun, and the trench warfare that left an indelible mark on the collective memory of countries that lost a generation of young men. Global coverage charts the development of the conflict from every perspective, while before-and-after sidebars set key episodes into wider historical context. "Eyewitness" feature spreads present direct accounts from soldiers and civilians, bringing home the human toll of "the war to end all wars." R. G. Grant is a history writer who has published around 40 books on topics ranging from the American Revolution to the Cold War. His major works include the DK bestsellers Flight: 100 Years of Aviation, Battle, Battle at Sea, and Commanders. He was a contributor to 1001 Days That Shaped the World, DK's World War II: The Definitive Visual History, and The American Civil War. Richard Overy is Professor of History at the University of Exeter. He is the author of more than 25 books on the World Wars, the European dictatorships, and the history of air power. In 2001, he won the Samuel Eliot Morison Prize for a lifetime's contribution to military history; and in 2004, he won the Wolfson Prize for History.